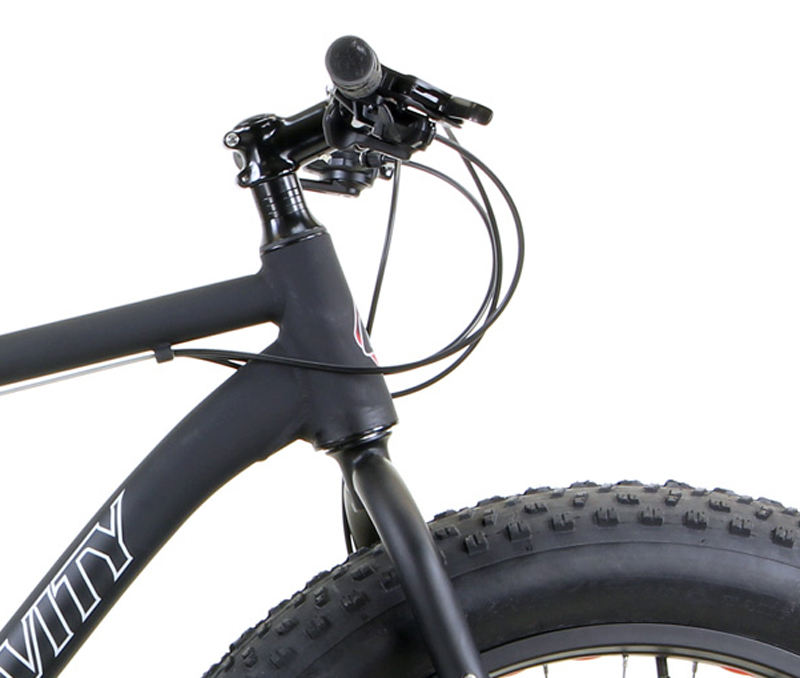 Mountain Bikes | GRAVITY BULLSEYE MONSTER FIVE | BULLSEYE MONSTER FIVE | FAT BIKE w/ DISC BRAKES | BikeShopWarehouse.com | FAT BIKES! Ingeniously simple concept. FAT BIKES! Ingeniously simple concept. Giant tires equals more control in loose conditions... Simple. The Gravity Bullseye Monster FIVE is a great way to go. Check the large holes in the rim. 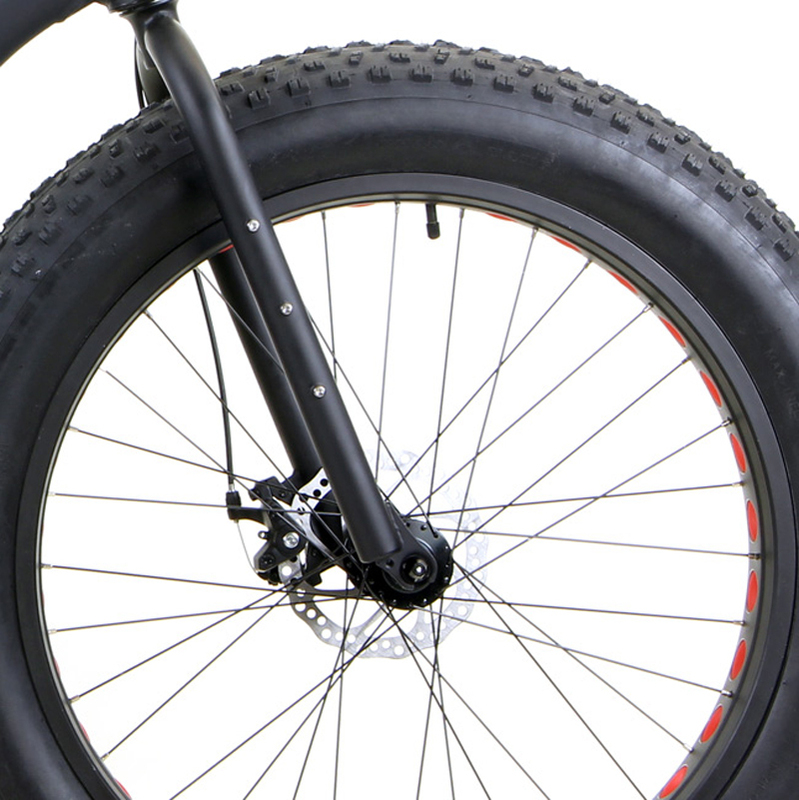 Most fat bike rims today are single-wall, one layer of material in the rim. With the cutout single wall rims, the one cool side effect is that you can see the rim tape that bulges out due to the pressure in the tube. Awesome fun, we have these in contrasting colors. 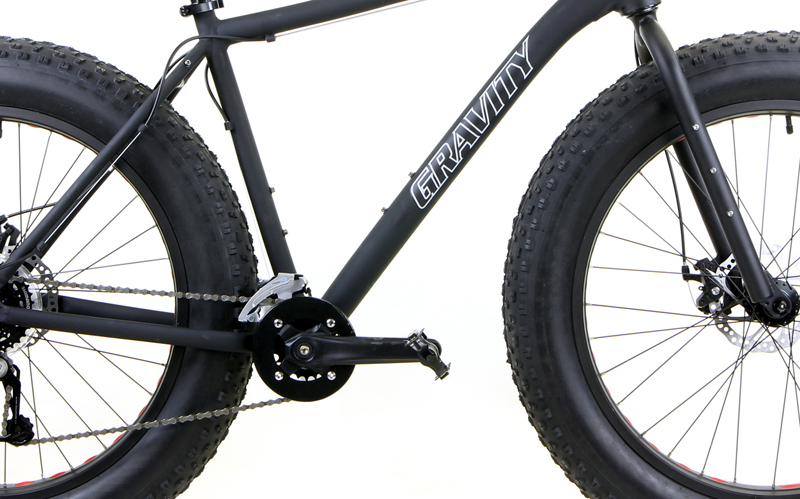 How much does a fat bike weigh, you might ask? These bikes are big and BIG FUN. Big weighs more. 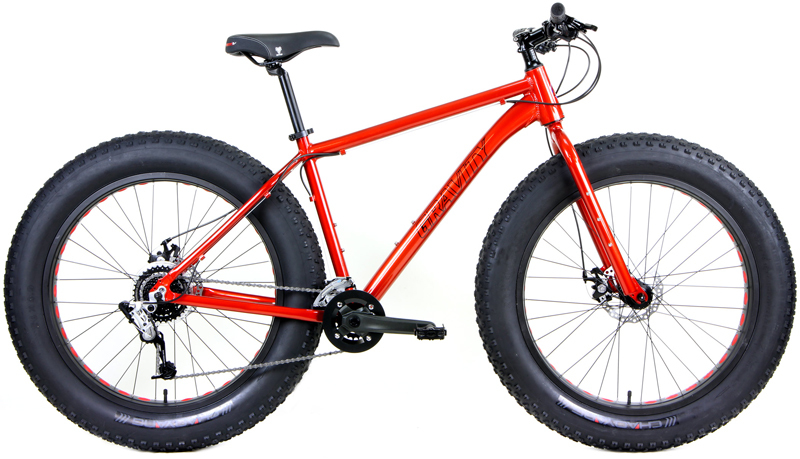 Most average fat bikes weigh between about 30 and 40 pounds. 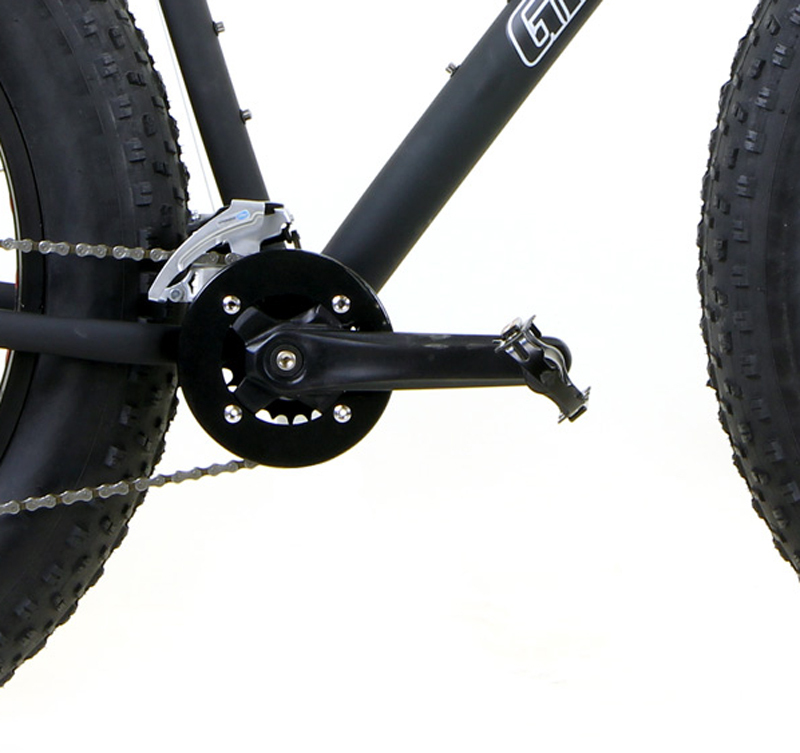 Compare specs, aluminum fat bikes with similar parts will weigh the about the same. You may ask how Fat Bikes ride? Way better than standard mountain bikes in snow, sand, or mud! No Doubt. You'll ride over absolutely almost everything. Float over three feet of soft powder snow or deep sugar sand and laugh! You'll do a tons more riding and way less walking. Awesome in rough conditions, deflate the tires to provide more traction. 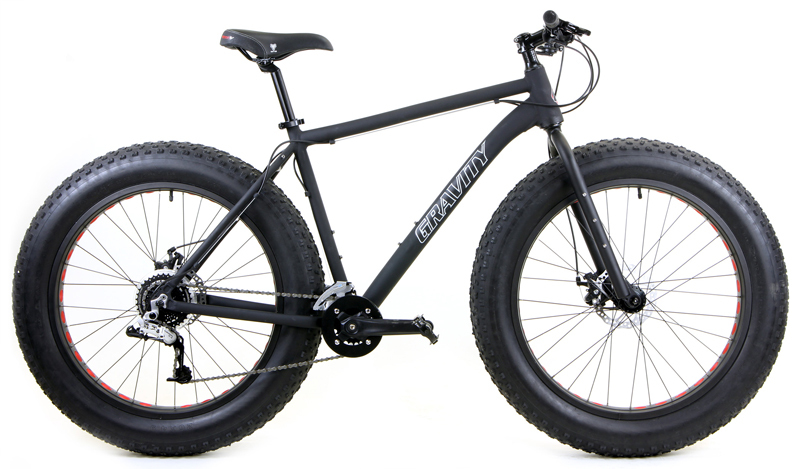 Compare Fat Bikes to the difference between a car and monster truck SUV. Your fat bike can go more places, like sport utility vehicles. The hottest trend in the mountain biking world right now. 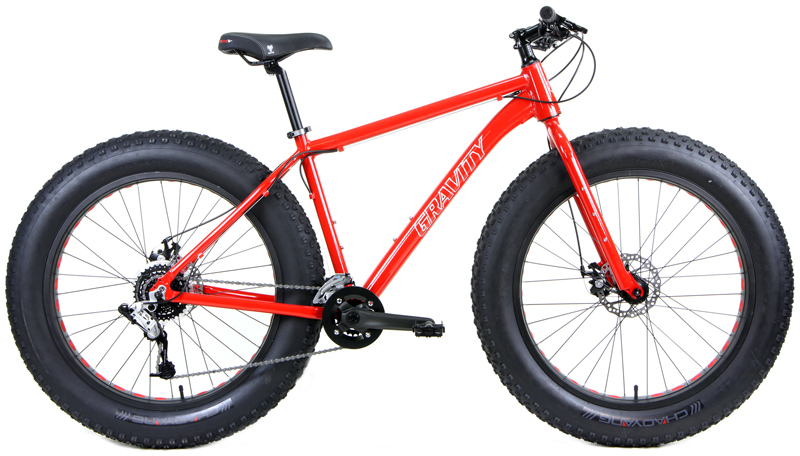 Fat Bikes are hard to miss. 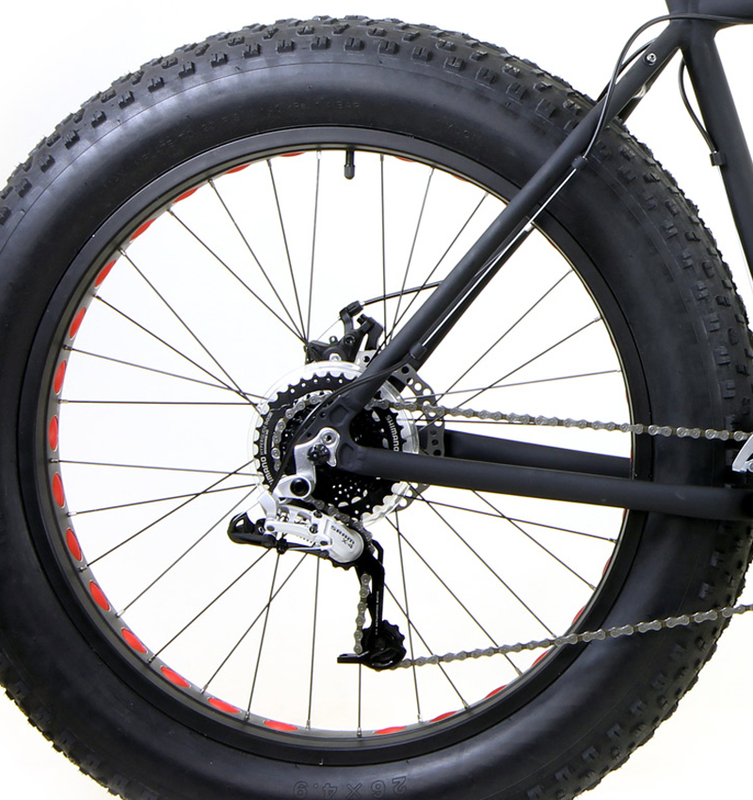 Their giant, 'fat' tires roll over virtually anything, which makes them an ideal winter mode of transportation because they help cyclists traverse snowy and icy trails with ease and traction. While the bikes were pioneered for snowy climates, such as found on the Front Range, they work well in a variety of environments including sand and loose rock, which has some local bike experts dubbing fat bikes as the all-around mountain bike of the future. And... you can get them at BikeShopWarehouse.com. 14" fits most riders from 5'5" to 5'8"
16" fits most riders from 5'8" to 5'11"
18" fits most riders from 5'11" to 6'1"
20" fits most riders from 6'1" to 6'3"
Between sizes? 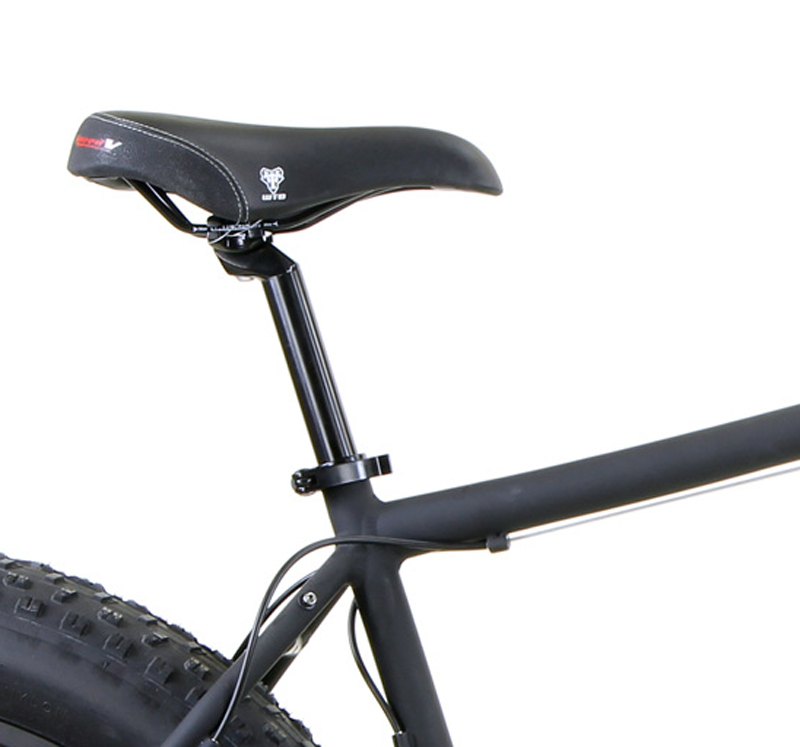 Size up for long upper body/legs, higher handlebars/longer bike. Size down for short upper body, more aggressive / lower handlebars. "I have had my monster for about 3 months now and have put about 500 miles on it. I love this thing… Love the beast for playing, love to ride the monster." "I CAN tell you for sure that the bullseye monster is a lot of bike for $500 and a great platform to build off of…Still taking everything I can dish out." "Got close to 75 miles on the monster and I really enjoy it." "Overall im feeling pretty stoked about this bike and think i made a great choice. …i am 100% satisfied. i feel like I got more than what i payed for. I still think that this is the best money I have ever spent on a new bike." PLEASE NOTE: Due to the size of these boxes, shipping costs are much higher. While we still do not charge for shipping, any returned Fatbikes will have $100.00 return fee deducted from your refund.